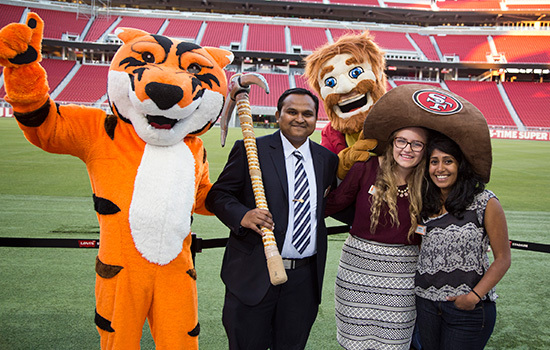 RIT mascot Ritchie hams it up with Sourdough Sam, the San Francisco 49ers mascot, as well as Hrushikesh Sagar ’14, Student Government President Andrea Shaver and Sneha Koka ’12 at Levi Stadium in Santa Clara, Calif., part of a series of RIT meetings in the Silicon Valley. A 82-member delegation from RIT held strategic meetings with 27 global high-tech companies and organizations from July 20 to 23. RIT also met with several hundred alumni on the trip, including Sagar and Koka, who work at Tesla Motors. 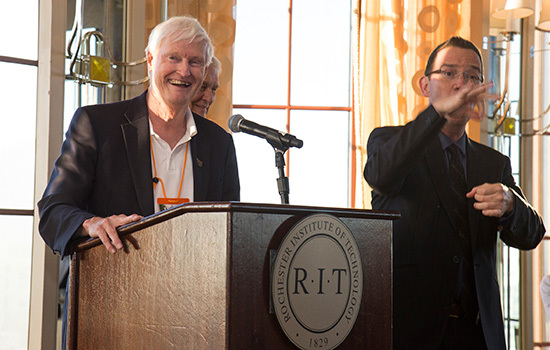 RIT leaders and California alumni see a perfect alignment between the mission of the university and Silicon Valley, the region that is world-renowned as the heart of innovation. That’s why an 82-member delegation held strategic meetings with 27 global high-tech companies and organizations this summer. Discussions during the “Silicon Valley Engagement Initiative” centered on innovation, entrepreneurship, corporate research and development, philanthropy, recruitment and alumni engagement. California is the sixth largest economy in the world and Silicon Valley—home to many of the most valuable technology companies on the planet—is the 10th largest. The region has an abundance of patent holders and traditionally attracts more than 40 percent of all venture investment in the U.S.
RIT’s presence in California is growing. More than 4,000 alumni live in the San Francisco Bay region, a figure that has doubled in less than a decade. About 700 RIT co-op students complete 1,200 work assignments each year in California, mostly in Silicon Valley. And California is the fifth highest state for RIT freshman applications; sixth highest in freshman enrollment. The RIT delegation included members of the Board of Trustees, Alumni Association Board of Directors, President’s Roundtable, West Coast Board of Advisors, governance groups and campus leadership. The delegation split into teams and made house calls to each of the 27 companies and organizations. From Adobe to Tesla, each delegation looked for future strategic opportunities for research and development partnerships, as well as new relationships for career and co-op placements, and future philanthropic support. Jeremy Haefner, provost and senior vice president for academic affairs, said the opportunities ranged from cybersecurity to UX (user experience). “The takeaway from our visit is that our mission as a university aligns perfectly with Silicon Valley. We are committed to having a greater presence in the region,” said Haefner, who is leading RIT’s West Coast Board of Advisors, a team that is advising university leadership on strategies along the Pacific. Haefner said RIT plans to offer certificate programs in information assurance (cybersecurity) to students in the San Francisco Bay area starting this spring. The certificates are designed for working professionals who will study in a hybrid format which features online and a lab environment with faculty. The “stackable” courses allow students to progress toward a master’s degree. RIT plans to lease space in a convenient Silicon Valley location, which will facilitate the delivery of hybrid programs and create a sense of community for RIT alumni and current students. “Ultimately the space will serve as a foothold for a greater presence and recognition in the Bay area,” said Haefner. RIT is also committed to hiring a full-time director of West Coast Engagement. The director will be the face of RIT in Silicon Valley and seek opportunities for research and philanthropic partnerships, as well as advancing new relationships for career and co-op placements. Oney personifies the enterprising culture of Silicon Valley. He has served as an Apple vice president and has been involved in eight startup companies. “Geek is chic in the valley. And RIT produces problem solvers and doers,” he said.